I had been trying to get my hands on ‘the one’ before finally setting my sights on this Warehouse beauty and making a b-line for the till. It’s the perfect length to wear with jeans and a simple jumper or top on those days where you just want to feel comfortable but still ‘put together’. That’s basically my style in a nutshell lately, I avoid anything that’s too fussy or that I have to find myself pulling at every few minutes. A statement coat and some vintage jeans have been my absolute fail-safe throughout December, and this shows no sign of changing anytime soon. In all honesty, as soon as the new year begins, I already start getting excited for Spring/Summer and the new transitional pieces the months ahead have to offer. I’ve mentioned quite a few times on here that my personal style is most at home during the cooler months – but Summer definitely owns my heart and soul. I pine for those long Summer nights, new adventures, and floaty vintage dresses galore. I always feel like I’m having more fun in Summer – maybe it’s just because it’s possible to squeeze more out of the day! I can become a bit of hermit during Winter – you’ll find me curled up with a good book, Netflix and usually some sort of snack. This is where the teddy coat comes into play – it’s the kind of coat that inspires me to get up, get out, and be productive! Owning a warm statement coat means that I can still wear the clothes that I like underneath and not just feel like one giant ball of layers. It’s nice to still feel good about your outfit, even in minus temperatures, but it’s also good to be practical about your choices (says the 75 year old woman in me anyway). This brings me to my next fail-safe Winter garment – the knitted dress! I have had this simple monochrome dress for years and it always comes in handy when I’m feeling indecisive. It’s the type of dress that never goes out of style in my opinion, and tends to suit everyone! It’s so easy to throw on with some tights and boots on those mornings when I’m too sleepy to rummage around for something that works. Like a Breton top and jeans – it’s something classic that I can rely on and find myself leaving for the day without checking in the mirror first. 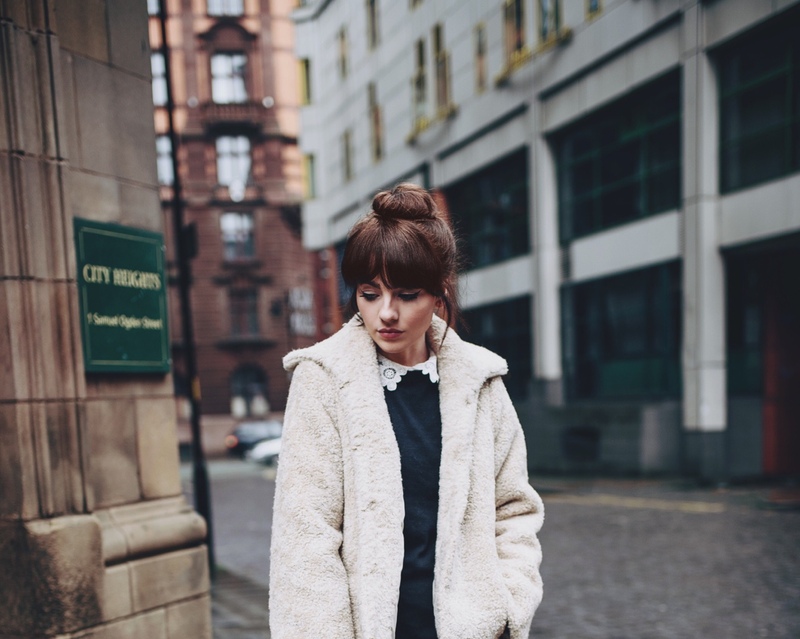 It’s got that school-girl chic vibe that goes hand in hand with a little vintage bag and a cute fluffy coat. I always enjoy outfits like this because I feel like I’m playing a character for the day – it makes my day more fun when I dress to suit my mood. I’ve acknowledged that I’m usually half way between ‘little French-girl’ and ‘somebody’s Grandad’ and those are both looks I’m happy to emulate! I really need a coat like this!